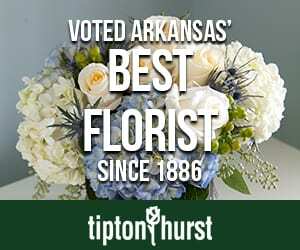 For decades, the owners of this home in Northwest Arkansas had their eye on the lot where they would eventually build. 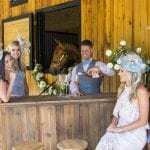 However, in all that time, there was always one small problem: It was never for sale. “We’d been driving up here since we were about 29 years old,” the homeowner says. “We’ve always loved this lot, but the people who owned it didn’t want to sell it. One day, we drove by and there was a ‘for sale’ sign nailed to the tree. 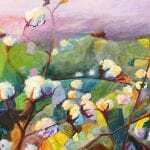 We bought it that day,” she says. 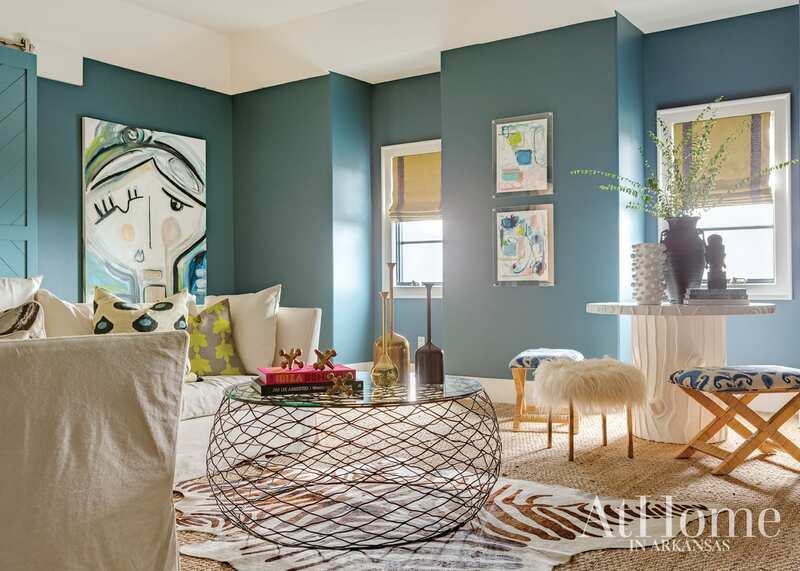 Though she desired this home to feel aesthetically different than her previous ones, the homeowner still wanted its style to reflect her personality. “She likes very avant-garde, out-there things, so we tried to bring some of that to every part of the house,” Casey says. “Casey hears me say this all the time: Where’s my weird factor? I have to have something weird,” the homeowner laughs. 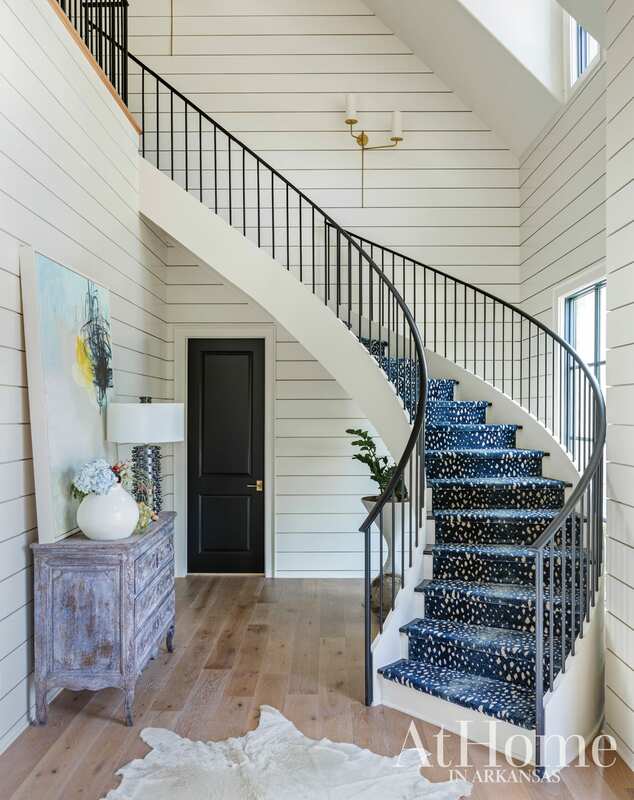 She points to the blue antelope-print stair runner in the entry, a hand-painted design in a hallway off the kitchen, and her personal art collection as elements that offer some of the unexpected. 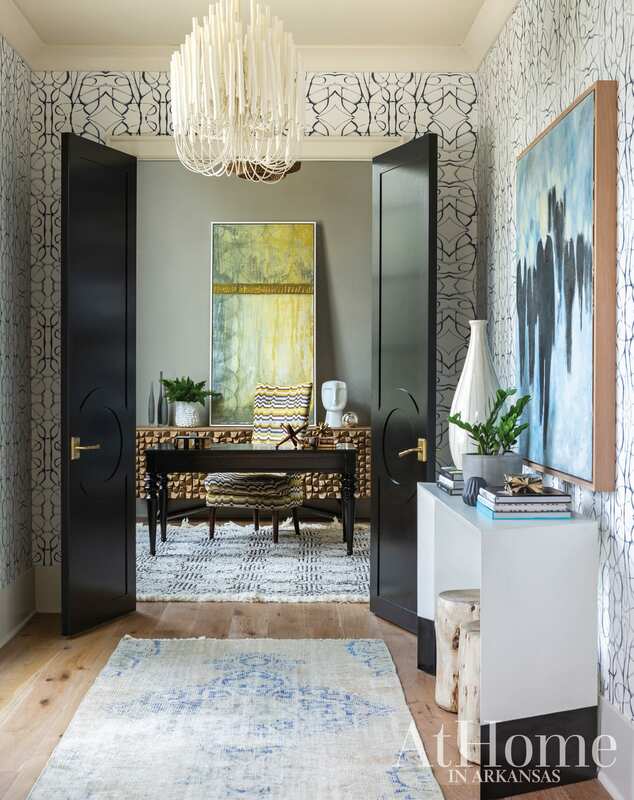 Designer Casey Sarkin and the homeowner worked together to come up with a concept for a pass-through that leads from the entry to the home office. “We wanted something feminine and unique leading into this more masculine space,” Casey says. 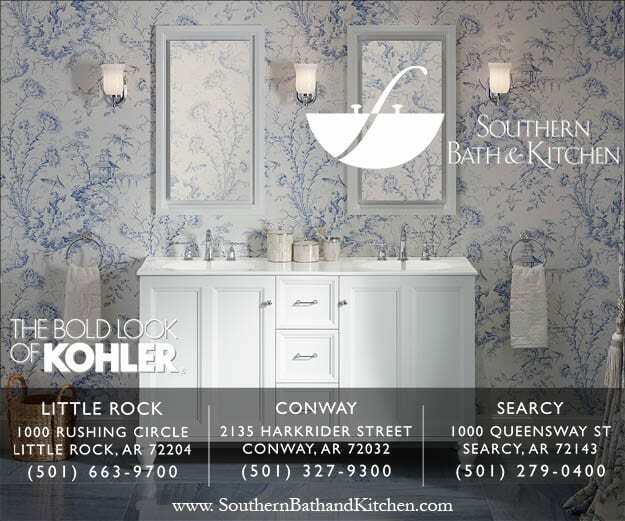 The kitchen is a perfect illustration of the homeowner’s departure from her previously more traditional style. “I wanted everything clean, modern, and more transitional. No fluff, no fuss,” she says. 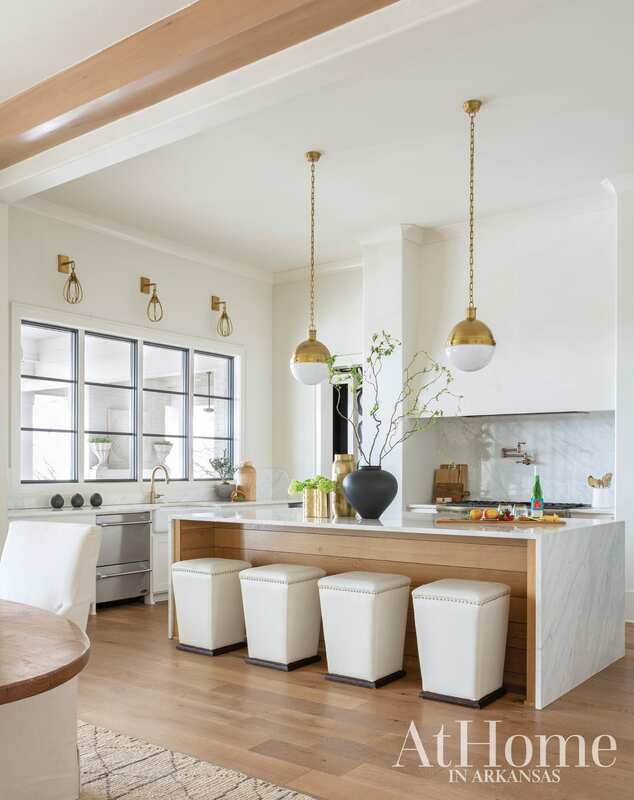 Here, an inset range hood and waterfall countertop play to the contemporary side of the design, while white oak, seen throughout the flooring, island, and decorative beams, adds warmth to an otherwise all-white palette. 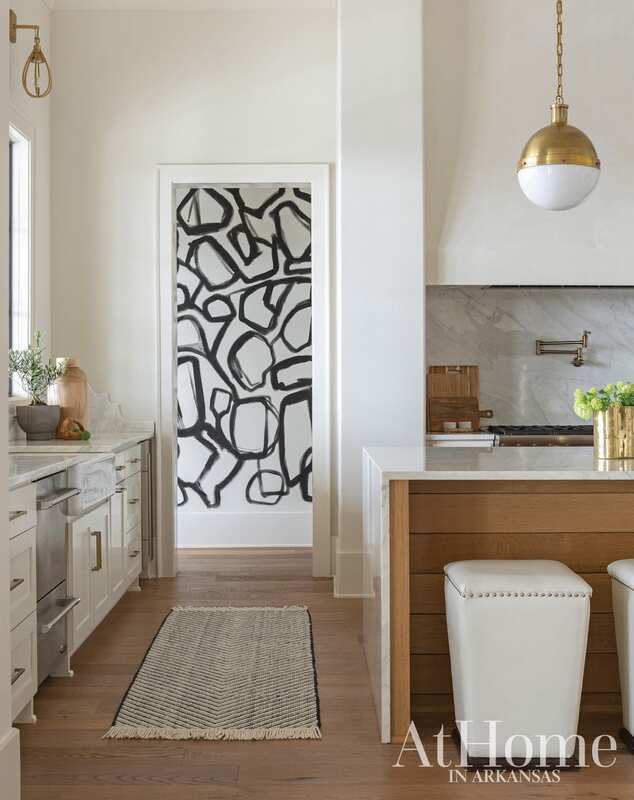 To add visual interest to a hallway that leads to a walk-in pantry, a powder bath, and the outdoor living area, Northwest Arkansas artist Allison Hobbs painted an abstract design on the walls. 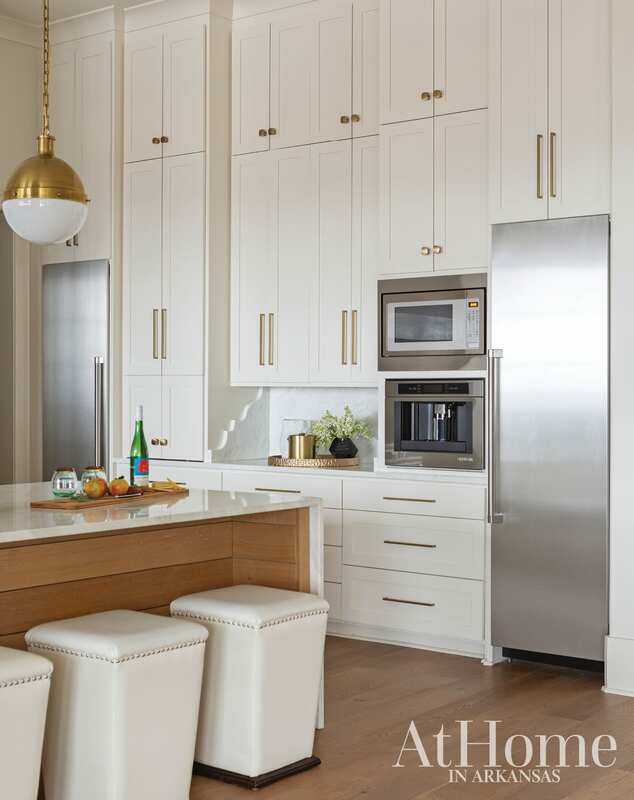 Since straight, clean lines abound, a scalloped edge on the Calacatta Crema marble backsplash is an unexpected flourish. In keeping with their promise to be very intentional in building this home, the homeowners decided to forego a formal living room, having rarely used it at their previous house. The home centers around one space that holds the kitchen, a casual dining table, and a living room, a space ideal for entertaining but made even more so by the four sets of French doors that lead to an outdoor living space and offer a panoramic view of the valley behind the house. “We worked really hard to coordinate the view through these doors right when you walk in the front door,” Casey says. 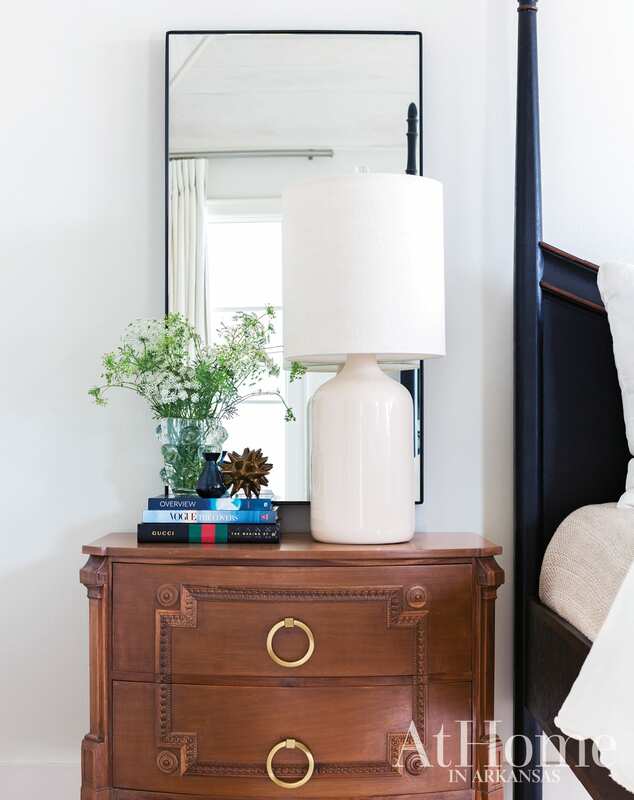 Nightstands used in the homeowner’s previous bedroom were stripped of their gray, chalky finish and given new life with a stain and fresh hardware. 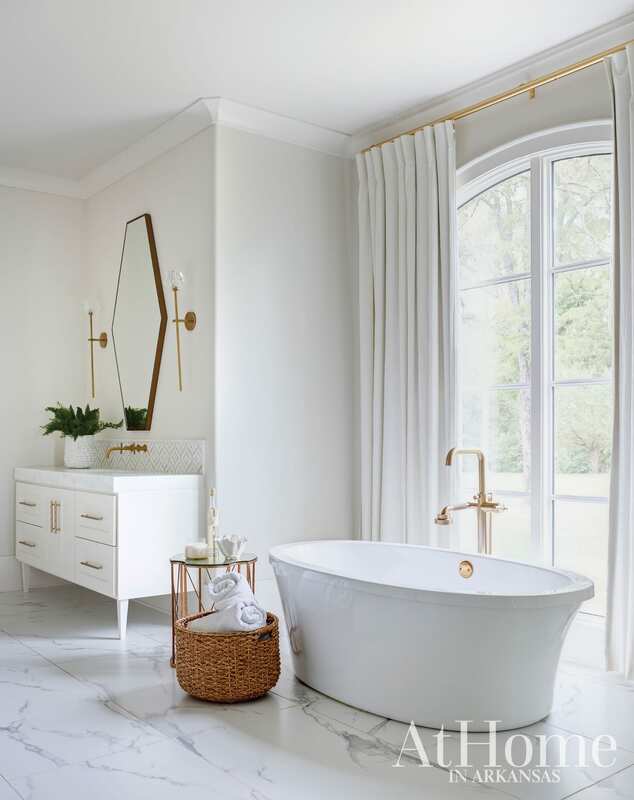 The home’s white palette continues into the master bathroom, where vanities on either side of the tub are accented with hexagonal mirrors and contemporary sconces. In terms of functionality, the space is a dream come true for the homeowners. 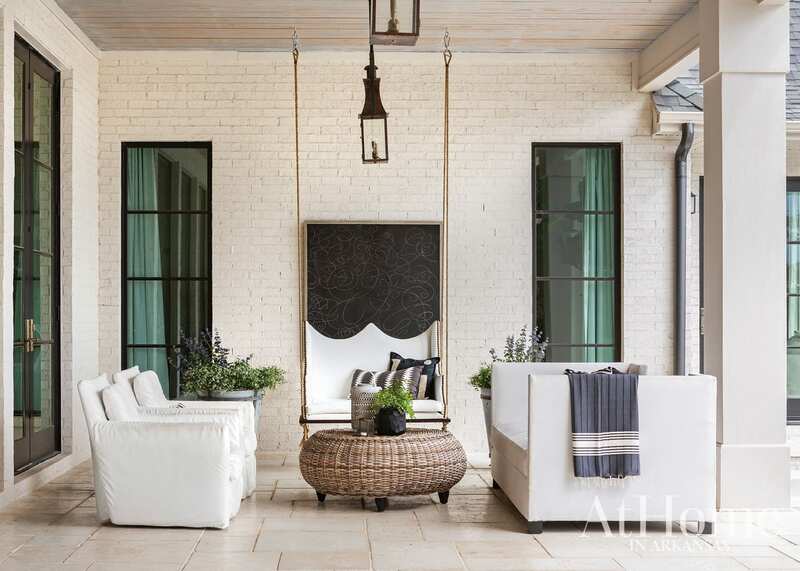 “I’d always wanted big floor-to-ceiling windows with a big soaking tub,” she says. “We wanted tons of storage, so they built a linen cabinet that goes way deep.” His-and-hers closets off the master bath checked another box on their list of must-haves. In the homeowners’ college-aged daughter’s bedroom, the starting point for design was a Lindsay Cowles wallpaper. “We wanted it to be super feminine but kind of edgy,” Casey says. “It can be hard to do edgy and soft at the same time, so we used this wallpaper and softened everything else in the room.” An open black canopy bed paired with pink mohair ottomans reiterates this choice. 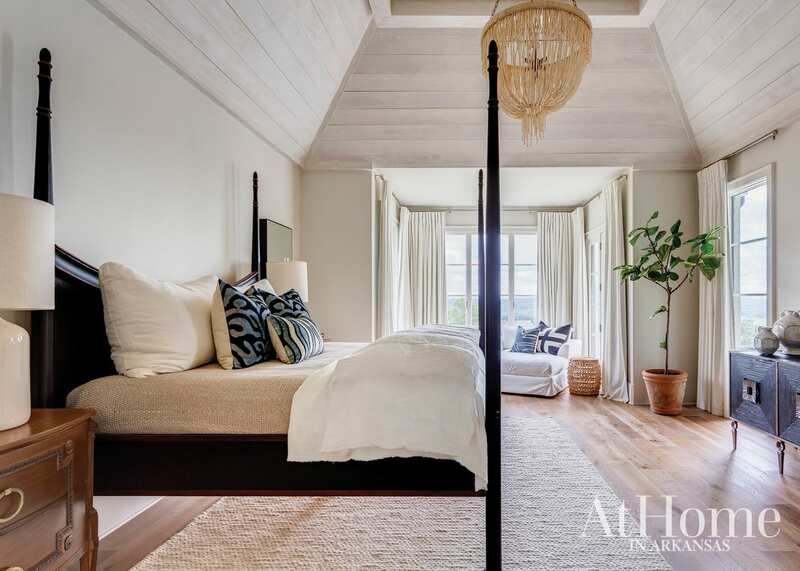 While the open floor plan downstairs is perfect for the empty nesters’ current lifestyle, they wanted to make sure their kids had a place to hang out when they came home and, eventually, a place for grandkids when that day comes. Upstairs, in addition to rooms for each of their children, there is a cozy media room and adjoining bunk room featuring two hanging twin beds. The same shiplap treatment seen in the entry is repeated in the bunk room, which, with the rope accents, circular window, and color palette, gives the space a nautical air.